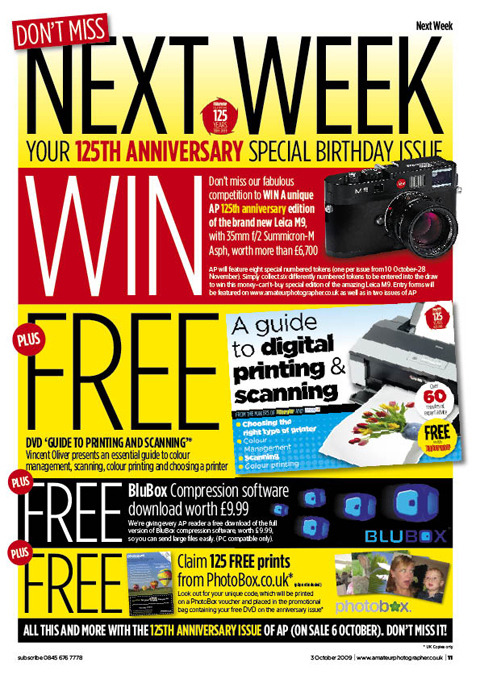 Amateur Photographer magazine is giving away 125 free prints - among other goodies - as part of its 125th anniversary celebrations. Amateur Photographer (AP) magazine is giving away 125 free prints – among other goodies – as part of its 125th anniversary celebrations. AP – first launched in 1884 – celebrates its 125th anniversary in next week’s issue, dated 10 October. AP has secured some great birthday presents for its readers. First, every reader in the UK who is lucky enough to get hold of a copy will get a free Vincent Oliver guide to printing and scanning DVD. BluBox is giving every reader a free downloadable version of its compression software, worth £9.99. And, as if that wasn’t enough, Leica is currently producing a stunning black leather, chrome-plated one-off Leica M9 which will be engraved with ‘Amateur Photographer 125th Anniversary 1884-2009’. It will come with a Leica 35mm f/2 Summicron-M Asph in a kit worth a total of £6,765. For readers to be in with a chance of winning this ‘money-can’t-buy’ piece of history – and to claim all the other presents in the AP anniversary collectors issue – they should make sure to order a copy now, as it is anticipated to sell out very quickly. Then, be sure to claim the 125 free prints, free software and the free dvd. Most importantly of all – start collecting the tokens for the chance to win the bespoke AP Leica M9 and lens.